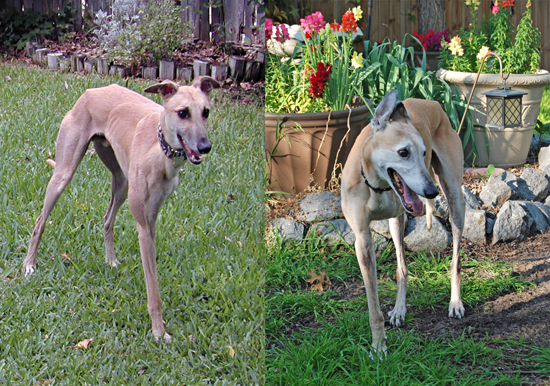 Chuy was my first greyhound, and what amazing dogs and people he brought into my world! It was a deep honor and pleasure to have such a loving and playful hound in my life for over 11 of his 14 years. Missing a front leg didn't slow him down a bit until the last year. In fact, when he was running, most people didn't realize he was a tripod. What happened to his leg? When Chuy was a puppy, his mother accidentally stepped on his leg and broke it. They set it, but since he couldn't bear weight on it at such a formative time in his life, the muscles, bones and nerves weren't able form properly. It was best to get it out of his way months later. Always the vocal greyhound, Chuy would sing loudly when happy and excited, and his roo was like a siren. I could always pick it out of a hound chorus. He lost his roo to laryngeal paralysis, but he could still manage a bark when I came home. May you run and frolic pain-free and young again, singing your song as big as your heart, my sweet Chuy Chihuly.